The Griffin's - Buy Premium Cigars Online From 2 Guys Cigars . The heart of a Griffin's cigar, the filler, maintains a blend consisting of three carefully selected tobaccos from different crops. Each Griffin cigar is carefully hand-rolled. This hand craft requires years of experience. The cigar roller uses his skill to shape the filler into the appropriate size and wraps it with the binder. 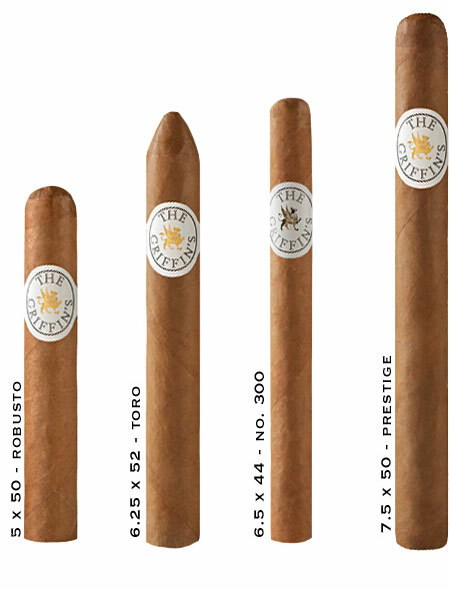 At the stage, the fillers and binder, referred to as the bunch, are shaped so that each cigar obtains an evenly rounded form. The next step is the application of the valuable wrapper. Only the best leaves from Connecticut are selected for the Griffin's wrapper. The job demands extraordinary skill from the cigar roller. Finally, the Griffin's cigars undergo a strict quality control and are sorted according to the color. Each cigar receives a Griffin's band, applied manually, and is then individually placed in the packaging. The finished Griffin cigars now receive the inscription ""Hand Made in Dominican Republic"" and the packaging is sealed with a guarantee label for your protection.